An exciting example of a modern library that unites the past and the future recently came to light with the opening of the award-winning Slover Library in Norfolk, VA. After a long planning process, the building program included the complete renovation of a historic building and the addition of a second connected structure. Interestingly, the historic Seaboard building did not start its life as a library. According to the Norfolk City Historian, the building opened in December 1900 as a post office and federal courthouse. In 1935, it became Norfolk City Hall, and remained so until the mid-1960s. Then, it housed Norfolk Social Services until the early 1970s and was privately owned up until the City of Norfolk purchased it in 2007. It is fascinating to me that it was even possible to repurpose the old facility into a functional library! I first heard about this project at a Design Institute event in November 2008. At the time, the City of Norfolk was preparing to close the Kirn Memorial Library and move the contents to the Seaboard building which was to serve as the new Norfolk Central Library. They were in the early stages of planning a major renovation that included a major addition, but the project owners had not yet chosen an architect or determined what form the building would take. As the project proceeded, Demco Interiors was fortunate to be involved in helping to furnish many areas of the library. The new building is a widely acclaimed success and here are some of the reasons that I believe have contributed to its renown. Libraries are of course rooted in both the past and the present, but they don’t often illustrate this in such a bold way. This building takes advantage of historic details that pay homage to the past. 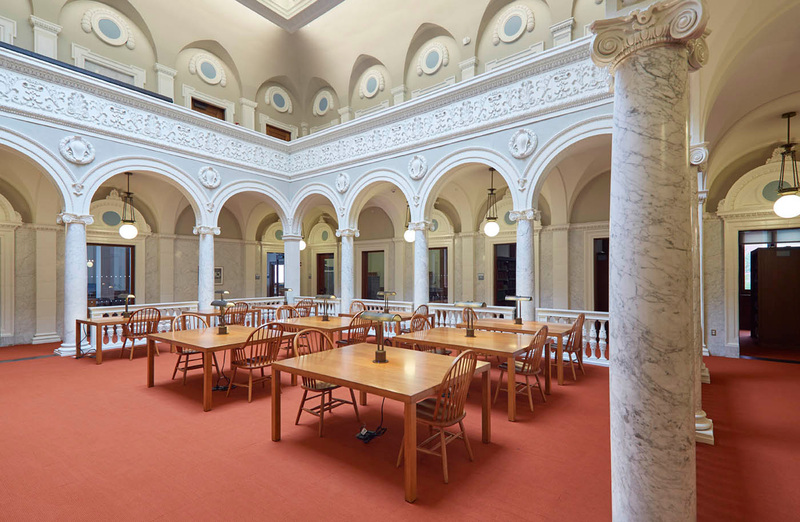 Note the beautiful, arching details of the restored reading room in the Seaboard building and the more traditional feel of the furniture. The renovated space recognizes the different uses that the building has had over the years and some of the remaining details speak to its time as City Hall. The transparent and inviting addition is connected through the Forum, which features a 3-story atrium. The Forum leads to the new 6-story addition with a much more modern feel. The hub and spoke design of the space is carried through from the old space to the new. In addition to the exciting new physical space, technology is used throughout to provide access to the historic collection in unique new ways, allow for creation and encourage exploration. Transitional Parson’s tables and Windsor-style chairs blend with the reading room’s historic architectural details. Libraries have become so much more than a place to check out books and the City of Norfolk recognized this. More importantly, they had local benefactors, Frank and Jane Batten, who wanted to make this the most technologically advanced library in the country and helped with the funding to make that dream a reality. 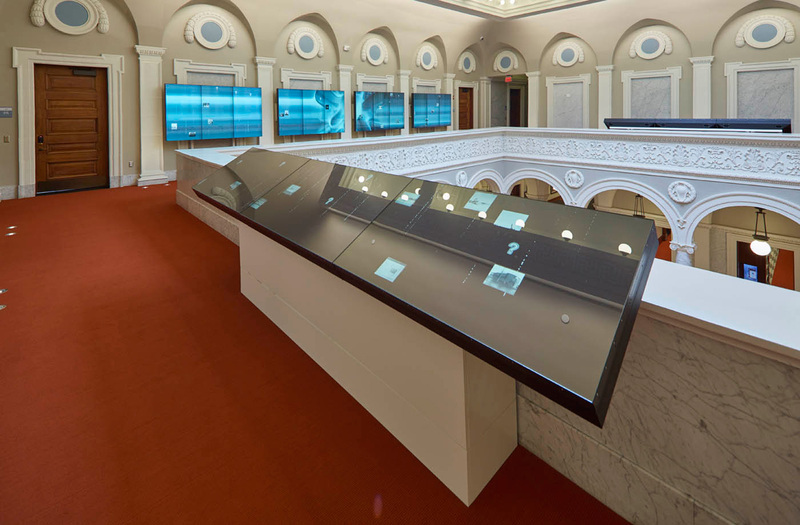 Throughout the building, touch screens allow patrons to access the collection, navigate the building or discover historic images and artifacts that are part of the Sargeant Memorial Collection. In addition, the space has been designed to be flexible and adaptable to changing needs and encourages collaboration and exploration through the variety of spaces that are available. Interactive screens provide digital access to an otherwise hidden historic collection. The Slover Library addresses the needs of their community regardless of their situation or age. The Children’s Services area provides the opportunity to learn, discover, play and explore. 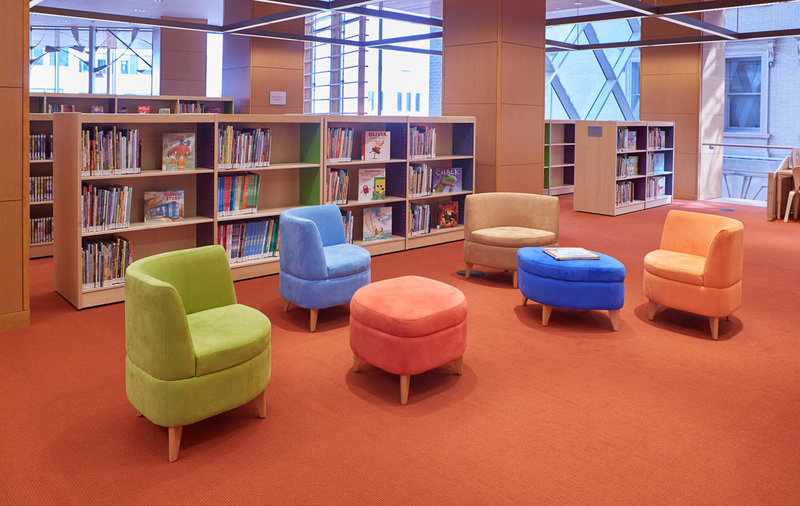 Books are part of the draw, but the there are also program rooms for projects and active learning and play places that encourage age-appropriate dramatic play. Teens have a space of their own that addresses their wide variety of needs in a casual environment. 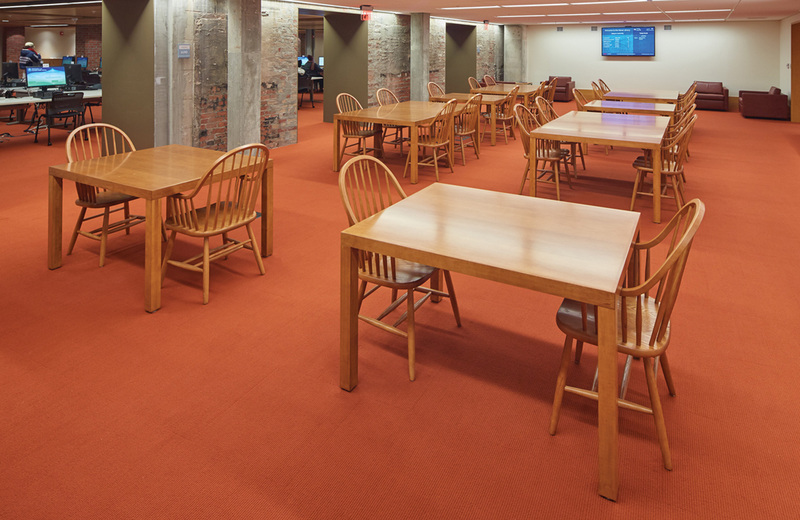 Plenty of both quiet spaces and collaborative study rooms are available. Numerous gaming stations also provide the opportunity for social interaction and just hanging out. Adults have a variety of spaces from the Popular Library that houses in-demand books, DVDs and other materials on the 1st floor to the large community room and Terrace on the 6th floor. In between, there are creation spaces, study areas, computer rooms and more. 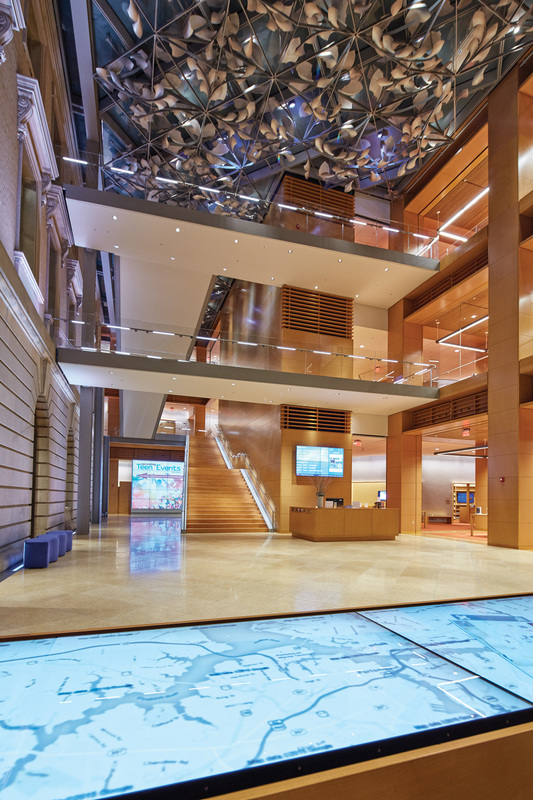 The City of Norfolk has been undergoing a downtown revival and the Slover Library is seen as a new anchor to the downtown district. 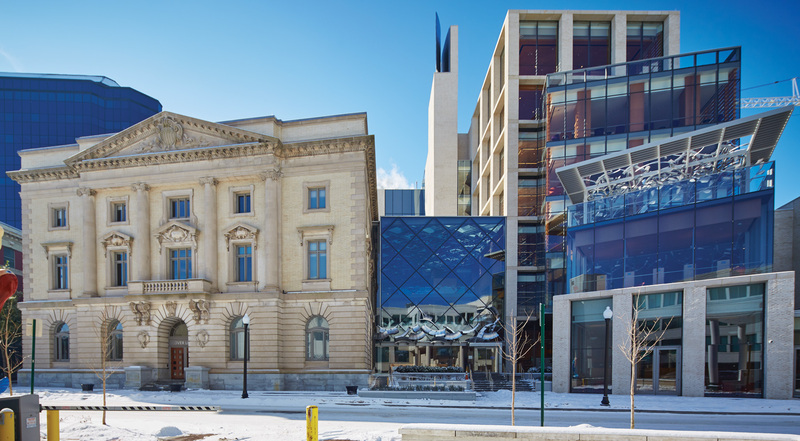 In order to create that presence, some of the funders of the library were interested in creating a building that would be architecturally unique and truly have a significant civic presence. 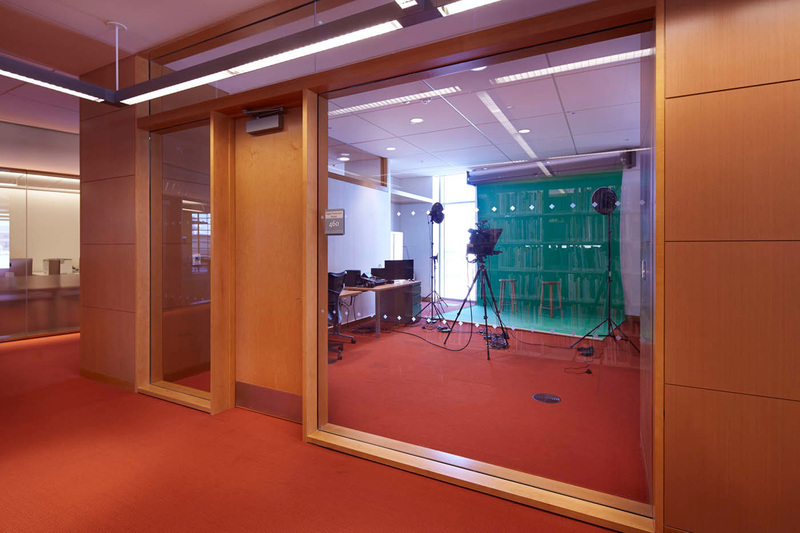 In addition, from a functional standpoint, Slover Library has positioned itself as a vital resource for early literacy, community learning, leading-edge information technology and civic engagement. 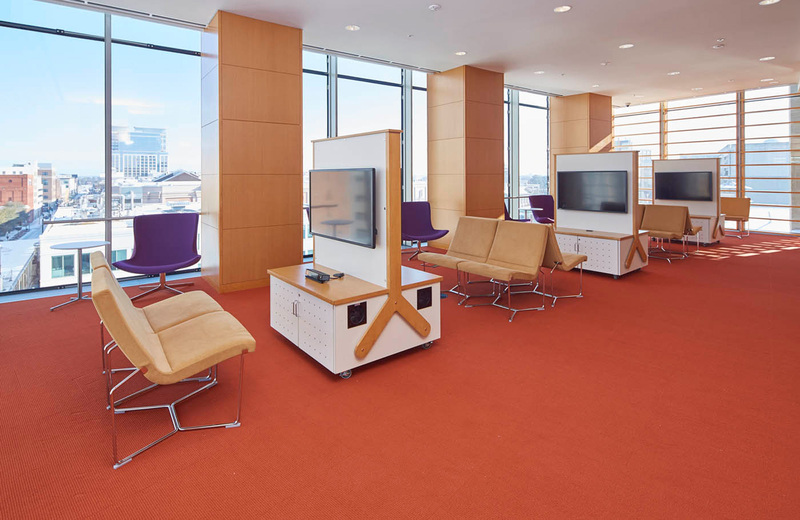 According to David Sullivan, Chief Information Officer for the City of Norfolk, “One of the things we wanted to see at Slover was the ability to connect the community.” The new library is doing just that in a variety of ways. In addition to the more traditional uses of the library, it is being used for weddings, business entrepreneurship, a meeting site for a wide variety of groups and generally a place to come together. This brief video does an excellent job of explaining how the architect and the city worked together with the community to address the needs in unique ways.